One thing the iPhone 4S doesn't have is the ability to set a timer for your photos with the in-built app of this smart phone. Fortunately this is where the Belkin LiveAction Camera Remote comes into the picture. In essence, this iPhone accessory basically creates a Bluetooth remove control for your iPhone camera. All you need to do is install the included batteries into the remote and then pair your iPhone with the device. Lastly, you then need to download the app to power this device called LiveAction. When the app is running on your iPhone, all you need to do is basically push either of the two buttons on the remote. One button is for taking pictures and the other is for recording video. It's that simple! Once you're up and running you'll never be out of those group shots again. Another cool aspect of the device is that it also comes with a stand for your iPhone so you don't need to worry about your phone falling over. 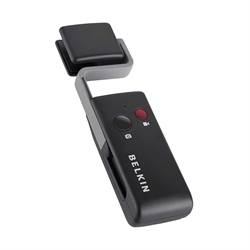 With 1-year warranty and the ability to take photos up to 10metres away, the Belkin LiveAction Camera Remote is definitely for those iPhone users who want to maximise their camera experience on this smart device.